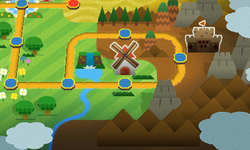 World 1 is the first world in Paper Mario: Sticker Star, located south of Decalburg. This world, composed of six levels, takes place in the grassy plains in two-thirds of the world, much like the Mario platformer games, as well as the high stone mountains in the latter third. A similar world theme style would be used in World 5 in the same game. Its appearance is based on World 1 (the plains) and World 6 (the mountains), both from New Super Mario Bros. Wii. Goombas and Koopa Troopas are found and fought here, and enemies like Bob-ombs and Spinies are first encountered here. Bowser Jr. and Kamek are first encountered here, along with the first major boss, the Megasparkle Goomba, and where the first Royal Sticker is found. This is also where Kersti shows off Paperization mode and where Things are first seen. This page was last edited on November 24, 2017, at 22:17.